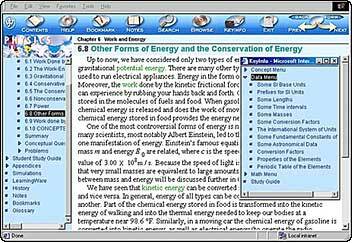 Navigation through the content is easy and uses Explorer or Netscape browsers. 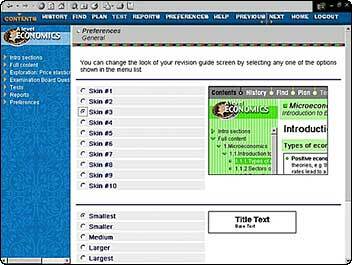 The two main navigation controls - content tree and icon bar - are immediately familiar to the students as they are similar to that of the Internet Explorer and other popular applications. Dynamic cascading content tree gives direct access to every screen of the title and changes in response to user customization. Powerful search engines get you to any main point quickly and easily. Sophisticated searching includes XML tagged context searching, keyword, boolean, full text, case sensitive, natural language, multiple word. Users are also able to select the Font size, and the 'Skin', or graphic style of the product, from a Preferences Screen.